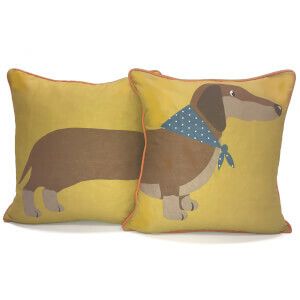 The Sausage Dog Cushion will add a fun and contemporary accent to a bed or sofa. Colourful and cosy, the reversible cushion features adorable dachshund images offering two looks: one side features a pack of the little dogs in vibrant shades of yellow, orange and blue on a white background, while the other side is a similar image in white and blue. The filled cushion will make a cute accessory and a delightful gift for any dog lover. Please Note: Image shows both sides of a single cushion.